Our testers were unanimously in agreement on CUBE, pure MYSTERIOUS shave gold. They found it not only long lasting, but SUPER effective in adding additional slickness and shield to their shaves with a noticeably better post shave feel...WIN! I should also mention, one found it super spooky and felt like it was watching him...take from that what you will. CUBE - 5 ounces and 6 sides of solid otherworldliness. CUBE is not your everyday preshave. 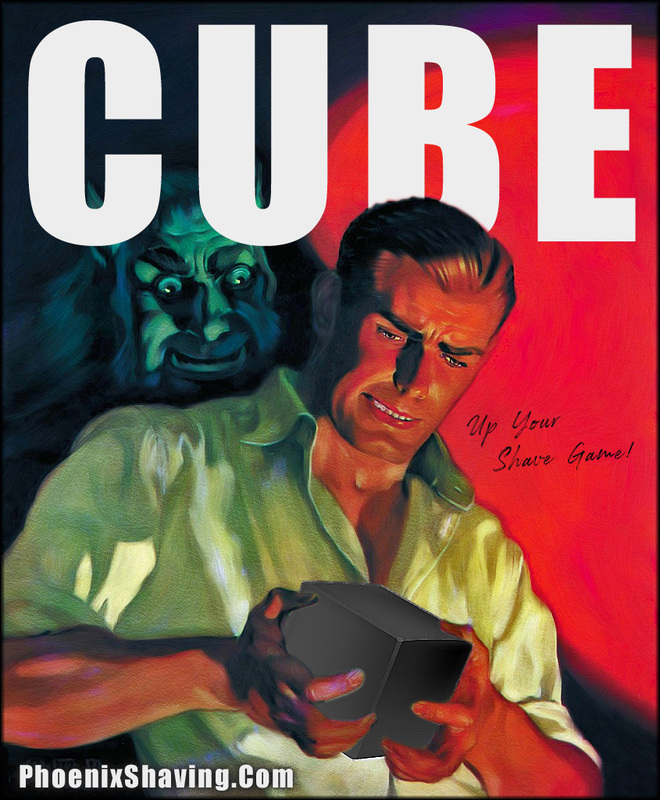 CUBE takes your shave to another dimension adding extra protection, hydration, slickness and glide. A powerhouse of slick with a kick of Activated Bamboo Charcoal! Glycerin is a humectant = Draws moisture into the hair, fattening it & softening it! Packed with Activated Bamboo Charcoal = Deep cleansing with light exfoliation. Adds a noticeable Boost to any lather! Why is Preshave Soap BETTER Than Preshave Oil? Well first off, as with anything in life, it all comes down to personal preference. I can tell you why I think it's better, but in the end, do what works for you! First off, unlike using oil, a Preshave Soap will not gunk up your gear and rinses away easy. I was seriously turned off by all the clean up involved when using oils. Plus I was always concerned about it getting into my favorite brushes undetected and going rancid. Also, applying oil with your hands then holding onto a blade is not the safest move in my book. [That said, if you currently use an oil, apply it with your non-shaver hand!] In short, Preshave Oils inspired me to find a better way! Why a Preshave Soap is More Effective. A preshave soap really offers more bang for your buck; for one, it's more affordable and longer lasting. Use it first to clean the face before you shave, then rinse. Then reapply the soap prior to whipping up lather: First in a circular motion, then against the grain. The soap gets under the hairs, slightly propping them up, giving the blade more surface area to "bite" onto. The glycerin acts as a humectant pulling more water into the hair, prepping and softening it, thus making it a bigger target to mow down! Another benefit is the Menthol option! With our mentholated preshave soap you can turn any shave into a cooling, mentholated shave despite what scent or brand of shave soap you choose to use! CUBE will Up Your Shave Game!